Courtesy of the Tokyo Motor Show. Last week, Tokyo showed off its renowned, eccentric nature and distinct charm during the Tokyo Motor Show, and automotive and technology enthusiasts the world over were ripe with excitement. On Japan’s biggest stage, many of the world’s foremost automotive companies and bigwigs all seized the opportunity to impress, discuss, and shape the ultimate portrait on how we’ll interact and navigate our the road to the future. Today we’re giving you the cliff-notes in case you find curating all that wonderful news and announcements more than a little daunting . In a presentation that surprised the crowd Mazda showed off an absolutely gorgeous SkyActiv-R—yes, that’s ‘R’ for rotary engine—concept. While the Wankel rotary was beloved by many, it also flies in the face of Mazda’s all-encompassing SkyActiv fuel-efficiency strategy. Perhaps tellingly, Mazda gave zero specific details about the powertrain. While no real announcement as to what vehicles will be equipped with such a heart was made or whether this concept will ever make it to production it’s still pretty noteworthy. Mazda is absolutely killing it in the design department with their latest concepts, and their presentation showed that the brand will continue to deliver cars that keep their trademark “fun” driving forward. The face of Nissan, Carlos Ghosn walked out and his noteworthy presence was used to focus on a presentation almost solely about autonomous driving. Showing off the Nissan IDS concept, Ghosn said that much like developing the world’s greatest-selling all-electric vehicle—the Nissan Leaf—the automaker would lead the charge with its developing suite of autonomous driving technology. If we were wondering what the pecking order for autonomous driving would be, Nissan’s chief may have given us a good idea. “This technology will first make its way in Japan, followed by China, Europe, and then the U.S.” Well-marked roads, clarity on responsibility and legislation are among the hurdles the U.S. will have to overcome. Still under scrutiny for recent controversies, Volkswagen’s “representative director of VW Group Japan,” Sven Stein, took a cue from VW USA CEO Michael Horn, who was the first high-level executive to publicly speak on the diesel scandal. Stein opened V-Dub’s Tokyo Motor Show press conference by saying “we have damaged Japanese trust in Volkswagen brand, and I can assure you along with headquarters we will do everything we can to restore that trust.” He added that Volkswagen still wants to pursue a diesel strategy in Japan, but first they want to be assured they have regained the public’s trust. For the moment, he said, execs are reviewing the timing of the new diesel launches. Dr. Herbert Diess, the newly appointed CEO of VW Group Japan said the automaker “did some things that were wrong, and behalf of the entire company, I would like to apologize.” He said VW would come up with good technical solutions for the affected diesel engines, and “we will uncover and expose the full truth of what happened, and we will make sure nothing like this ever happens again.” As to what’s next, Diess said Volkswagen would strengthen its focus on the essential automotive technologies of the future, calling out “electro-mobility” specifically. The Vision Tokyo follows the aesthetic we’ve seen from recent Mercedes concepts like the F 015 shown off at CES earlier this year, and the Concept IAA last month in Frankfurt. Boasting one door, a fold-down chair should the driver want to actually drive, and ditching the seats in favor of an oval sofa, Mercedes clearly had some fun playing with a pretty out-there concept. On the “smartcar” side of things, Smart showed off its new ForTwo for the first time in Japan, and after spending a few days in Tokyo, Dr. Winkler made it clear that the Japanese capital served as one of the great inspirations in the micro-car’s development. Densely-populated Tokyo, and its outspoken denizens are wacky, fun, stylish, with both a sensibility and flair unlike anywhere else. While the ForTwo may seem out of place on a Los Angeles freeway, its right at home in a city like Tokyo. Lexus showed off their vision of new automotive technology with the distinctly proportioned and dramatic, sleek styling LF-FC concept which has since drawn considerable attention. Huge crowds photographed the new fuel-cell powered all-wheel drive flagship concept for a good half-hour after Lexus took the wraps off. Perhaps most interesting is the timing of this ‘concept,’ which Lexus president Tokuo Fukuichi hinted will come in the near future. Perhaps a replacement for—or the next-gen of—the Lexus LS? Coinciding with their luxury brand Lexus, Toyota drew the largest crowd of the day, and the country’s biggest company kicked off its press conference by bringing up Florida Marlins outfielder Ichiro Suzuki. Playing into the ‘what wows you?’ theme, Ichiro said regardless of how good of a year he may have, he tries to switch up his hitting technique. Possibly a message that the world’s largest automaker can’t become complacent—and continuing Toyoda’s call to bring back the fun—the conference served as both a pep talk, and promise of good things to come. Perhaps the collaboration with BMW will bear some fruit after all? Toyota also kept the quirky going with its Kirobo Mini space robot, and minute SF-R coupe concept, which needs to be built immediately (and probably wouldn’t come to the U.S., even if it was made). And finally Yamaha, (yes the one and the same known for their motorcycles, stereos, and musical instruments) made the final surprise for the even with the unveiling of their own carbon-fiber sports car concept. It looks like the offspring of the Alfa 4C, and a mini NSX, but no matter what you see it as, Yamaha surprised everyone with some seriously sensual sheet metal in car-form. Boasting lots of pricey carbon-fiber, McLaren’s Gordon Murray can take a bow for a job well-done on the design-side. There were so many exciting new possibilities for drivers and techies the world over in this one big auto show and some of them have us salivating over the possibilities alone. 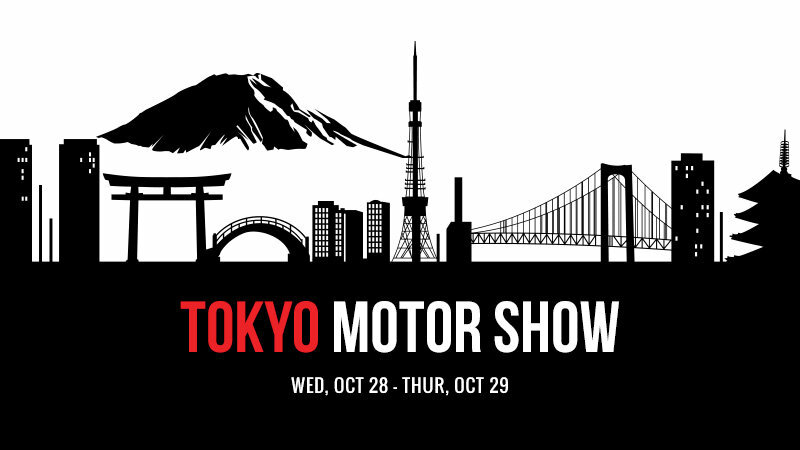 What were some of your favorite announcements from the Tokyo Motor Show? Comment below and let us know what you think!